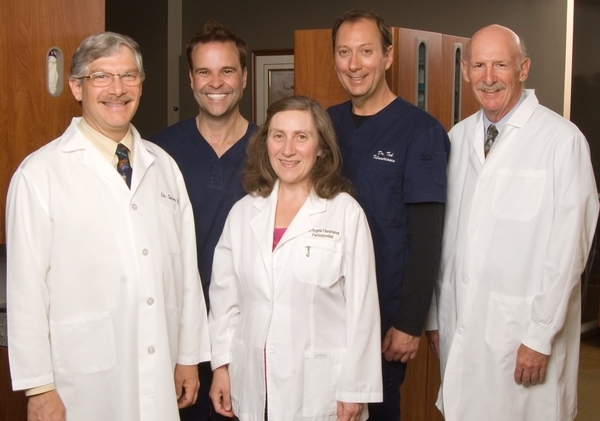 Left to right, Dr. Steve Bader, Dr. J.M.Biebuyck, Dr. Angela Filandrianos-Sykes, Dr. Ted Filandrianos and Dr. Barry Goldberg. Our doctors are caring, skilled professionals, dedicated to simplifying what is often a very complicated and confusing area of health care. We want all our patients to be informed and knowledgeable about their dental health care, from treatment plans and services, to insurance coverage. We look forward to assisting you in achieving optimal oral health and a beautiful smile. Contact our Boston area dental office today if you have any questions or would like to schedule an appointment. Please click on the links below to learn more about the doctors in our Newton Centre Cosmetic & Advanced Dental Implant surgery office. Barry J. Goldberg, D.M.D., M.Sc.D.